Who Doesn't love a Play! Does your child’s inner actor or actress yearn to be free? Looking for some creative interactive activities for bored kids? Looking for some creative ideas for fund raising ventures? Does your classroom need some new and innovative hands on lessons? Fabulous plays adapted from well-known classic children’s stories. Children have a ball pretending to . . .
sing and dance with Jack and Jill, Little Bo Peep and others. Chuckles are unavoidable, from spectators and actors alike, with the tongue tangling linguistics of the old medieval ages in King Alfred and Robin Hood. Craft Projects – Props and costumes make great craft projects. Fairy Tale Plays is not available in stores. Join in the fun. Get your copy today! But wait! Your e-books come with an . . .
Fairy Tale Plays, Skits and Puppet Shows E Book is totally risk free to try. Nothing to lose. If it isn’t everything I said it is, then return it for a full refund. You get instant access to your copy of Fairy Tale Plays in under 10 minutes through a safe and secure transaction. Right after your order is approved (usually in seconds), you will be able to download immediately. It's that easy. And, with PayPal you know it’s secure. Best of all, you don't have to wait for days or even weeks until the mailman brings your package. So, that means you save shipping costs too! With a cast of 14, this is a favorite classroom play. The whole class might join in for a dance at the ball, while the actors re-tell the classic story of Cinderella and her Prince Charming. The classic story of faith, trust and resourcefulness and good over evil. With a cast of 23 plus extras, this is a great play for the classroom. Classic favorites Little Bo Peep, Little Jack Horner, Jack be Nimble, Mary Quite Contrary, Jack and Jill join Mother Goose, Old Mother Hubbard and the rest of the gang in a May Day Party. Singing and dancing and nursery rhymes make this play a fun skit for all. A story of faith and trust. The young actors will learn that putting trust in the hands of a stranger may well lead down a dangerous path. A story of predjudice, acceptance and fairplay. A small cast of 8 shows that nothing good comes from the mistreatment of another. Riches are not always baubles sparkly and bright. Every child delights as Cornelia tells the nature of her jewels. Although the cast is small, it tells a great story highlighting the seasons and teaching their differences. What is great about Monday? How did Tuesday come by the name? Who is Thursday named for? For a cast of 7 it provides an imaginative tool for teaching about the days of the week. Here is a wonderful play, where the actors pretend to be birds and trees. No human parts, but that young thespian light shines bright nonetheless. Don’t forget the 100% money-back guarantee for 30 days. Hurry while this low price lasts! Click here for your free sample play Robin Hood and Allin A Dale. Oh, and don't worry, this free play is not repeated in your Play Book. 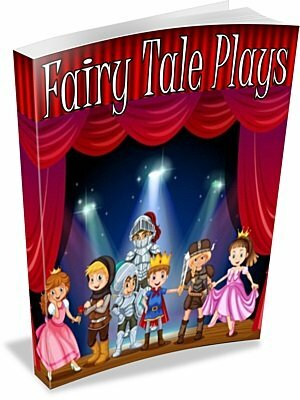 When you purchase the Fairy Tale Plays E Book you will get 16 totally different and fun playscripts. This Robin Hood Play is yours to keep and enjoy no matter what you decide.